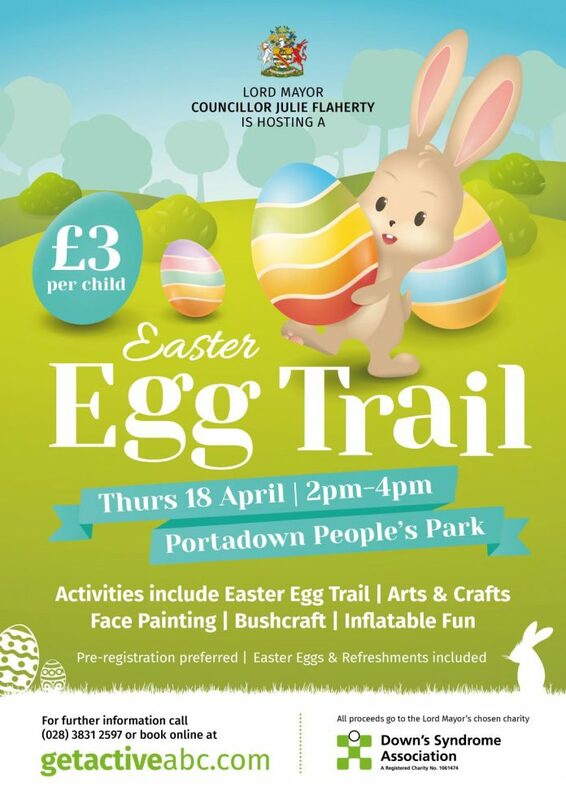 Home Council News ‘Egg-citing’ Easter egg trail in Portadown People’s Park! Hop on down to Portadown People’s Park this Easter and go ‘eggs-ploring’ for some yummy chocolate treats at the Lord Mayor’s ‘egg-citing’ Easter Egg Trail! Taking place on Thursday 18th April from 2pm – 4pm, your little bunnies can enjoy a fun-filled afternoon of activities including face painting, inflatable fun, bushcraft, arts and crafts and of course the fabulous Easter egg trail, with characters, to keep all your little ones entertained – all for just £3 per child! All proceeds from the afternoon will go to the Lord Mayor’s Charity, – the Downs Syndrome Association NI. Tickets on sale now – Pre-booking is advised by booking online at getactiveabc.com or contact David Mayers on 028 3831 2597 – a brilliant way to kick start the Easter holidays!